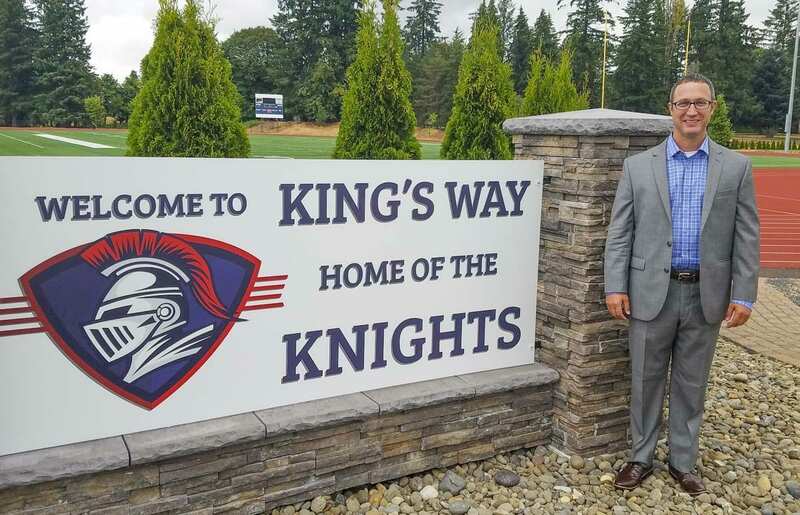 VANCOUVER — The new superintendent of King’s Way Christian Schools brought a sense of humor to the job. “Look up the definition of awesome in the dictionary. They finally found that somebody,” Dr. Jason Tindol said with a smile. In reality, King’s Way believes it has found the right person for the job, and Tindol expects to be here for an extended period of time. He had his family — his wife Jody and their three children — are making the move from Missouri. “We’re not renting. We’re buying,” he said, adding that he does not believe God called him for a short stay in the Northwest. That should help put parents, students, and school board members at ease. For myriad reasons, King’s Way has had steady turnover at the top. Tindol is the fifth superintendent this decade. Tindol said everything is set up for long-term success now. He expects to be a superintendent, and a superintendent only. He will not be a principal at any of the schools — the preschool, the elementary school, the middle school, and the high school. Tindol started his role in July. His family is expected to arrive later this month, in time for the new school year. His son Weston (an incoming third-grader), and his daughters Avery (seventh grader) and Kinsey (11th grader) will all be students at the campus in Vancouver. Tindol, who has lived all over the world as a son of a U.S. Army officer, worked as a principal in Nashville, Tenn., for 13 years before moving to St. Joseph, Mo., where he was the superintendent for four years at a smaller private school system similar to that of King’s Way Christian. He will bring with him a similar philosophy, too. Extra-curricular activities are essential to the success of a school. He will support athletics and he said he is “known for” putting an emphasis on the fine arts. “If you have great teachers, a great band instructor, a great choir director, you’re going to get great kids,” Tindol said. Because he is new to King’s Way Christian, he is not sure exactly how he will emphasize these programs just yet. He does promise to look at scheduling, to ensure all students who are interested will have the opportunity to participate in fine arts. Jesus Christ will be at the center of all things on the campus. The Northwest will be new for the Tindol family. They know they are where they are supposed to be, though.